IMPORTANT! 6-SPEED OWNERS PLEASE READ THE INFORMATION IN THE BOTTOM SECTION FIRST! The perfect upgrade to ANY Miata! Since it is impossible to change the washers and bushings without destroying the lower shift boot, we include this in every kit. You can re-use the upper shift boot if it is in good condition, so we give you the choice of including it in the kit or not. Use the selector on the right to configure your kit. To learn about the process of rebuilding your shifter, please check out our Instruction Manuals and Installation Guides in the Tech Center. 2001-2002-up 6-SPEED OWNERS PLEASE NOTE: Mazda changed the design of the 6-speed transmission somewhere in-between the 2001 and 2002 model years. If you have a 2001-2002 6-speed, please check your VIN nameplate on the transmission to determine what shifter bushing it needs. If the last six digits of your VIN are BELOW 220739, order the standard 5-speed bushing (this product page). 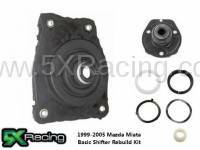 If the last six digits of your VIN are ABOVE 220738, order the modern 6-speed rebuild kit we offer HERE. Our Miata shifter rebuild kits use all OEM Mazda components with your option of the OEM plastic shifter tip bushing or our upgraded race proven Bronze shifter bushing. The OEM plastic bushings will eventually become brittle from the heat-cycling and break, so we of course recommend upgrading to our bronze bushing for your track or street based Miata to ensure longevity and strength where you need it the most. NOTE! We've recently redesigned our bushings to better accommodate the wide range of tolerances in worn shifters and new shifters, which contributed to either a loose or tight fit. Previous designs incorporated a "snap-in" fit, which we also eliminated because we found a way to not need it in our new design. In the end, this current design will work best overall, as it will install easier and accommodate shifters with broken assembly bushings and boots as well. I will give it 10 stars if I could, I bought this kit with the bronze bushing and I have only gotten around just to put the bushing in..WHAT A DIFFERENCE, it feels completely different from my old shifter. It feels strong, there is not more play and it shifts perfectly now..and that is only by switching the bushing.. I have to admit, my shifter was feeling sloppy so I ordered the 2002 5 speed rebuild kit with the boots and bronze bushing. Figured the boots were bad, since I've replaced them before, and this is what it felt like. After tear down, my boots were not bad, so I did the rebuild with the kit and bronze bushing, removed the old turret oil and replaced with new. Wow, very crisp shifting. Amazing, don't think it ever shifted this crisp. Highly recommend if your shifter is feeling a little sloppy. I knew my bushings and boots were bad, but when I took everything apart most of them were completely broken. Changing it all out with the stuff from this kit has been such a massive improvement. A breeze to install, buy the full kit and bronze bushing! Once you get the old shifter out, and watch some YouTube tutorials, this is very simple to do. I recommend getting the upper and lower boots. Then you will have everything you need. I also recommend the bronze shifter bushing! It's great. I installed the full rebuild kit with bronze shift bushing in my 84k mile '01 LS 5-speed. I've done this operation before - no surprise that replacing torn boots with new boots makes a HUGE improvements on cabin comfort (less drivetrain noise and heat). But this is my first time to use a bronze bushing rather than plastic. I love it! More direct feel. Quick, precise shifts. No regrets. I haven't found another place that sells a complete OEM kit for less. Shipping was free and and lightning fast. The parts were carfully selected and included a newer MX-5 bushing that is superior to the earlier part. I opted for the bronze bushing, fit perfect, my shifter is super tight. The instructions are straight foward and east to understand. If I could complain about somthing, I wish they would have a better sticker, perhaps a clean two color decal I can stick on the inside of my hardtop. I purchased the shifter rebuild kit with the bronze bushing and couldn't be happier. I have a 2000 with 233,000 miles, so it was definitely time to rebuild the shifter. Although my original OEM plastic bushing was completely intact, both boots were completely torn and the shifter had a lot of play. After installing this kit, my shifter is tight and buttery smooth. Do yourself a favor, order this kit with the bronze bushing. I had originally purchased an OEM rebuild kit from a Mazda dealership using Amazon, but after waiting over a week I was issued a refund out of the blue from Amazon. Not wanting to bother with that again, I googled an found this kit from 5X. Man, what a world of difference. Not only was it shipped to me very quickly, it was cheaper and also higher quality (because of the super sick bronze shifter bushing). Also came with a bottle opener and a sticker! Definitely can't go wrong here. As for my miata, I managed to toast my 156k mile transmission and I decided to buy a rebuild kit for when the new transmission went in. I'm tellin ya, this kit is amazing. The bronze bushing, I can't fully describe how much better it feels than the original, worn out nylon, other than superb clarify and lack of play. Install was a breeze, got the racer version with bronze collar. Made world of a difference, thanks 5xracing!